At least part of the lack of understanding concerning salvation I believe can be attributed to two factors: 1)The Western proclivity for concrete definitions, and 2)The fact that salvation is, in the end, a mystery and a personal experience between an individual and God. In an effort to define salvation the West has articulated various and conflicting positions on salvation. In my native Evangelical Protestantism the end result of these varying positions has been not only divisions, but also seems to have led to salvation being primarily associated with getting into heaven. Thus to the Evangelical Protestant mind salvation is associated primarily with a completed past action: the moment they “accepted Christ,” became indwelt and sealed by the Holy Spirit, and were assured entrance into heaven upon death. * The downside to this association is that it can easily minimize, or even completely remove, the necessity and importance of following the commands of Christ and seeking to live more like him everyday. Now to be fair Evangelical Protestants certainly agree that one must follow the commands of Christ, and if they aren’t then they have either abandoned their faith or were never really a Christian in the first place. However this is not called salvation in Evangelical Protestantism, but rather sanctification (becoming more like Christ). And while, technically speaking, sanctification may be included in the salvation process, dividing the process into different parts and defining different terms for each of the parts puts one at a significant disadvantage when reading Scripture because there does not seem to be such a distinction in terms made in Scripture. It is simply a form of “save” and could refer to the getting into heaven aspect, the sanctification aspect, the future glorification aspect (not discussed here), or could refer to someone being in physical danger, such as drowning, and in need of rescue. The process of being restored to our original, perfect state of being from our current evil and depraved state of being. For an adult this process begins first with the recognition that Jesus is God and reconciled us to the Father, from whom we were separated at the Fall, through his crucifixion, death, burial, and resurrection. Then as soon as possible baptism should follow. This is the pattern that we have seen so far in the Act of the Apostles. First the “men of Judea” recognized who Jesus was, then they were baptized. Baptism, I think, is best viewed as the initiation rite into the Church, regardless of what one believes happens during baptism. As such I do not have an issue with baptizing infants since I do not see any good reason why a child of Christian parents should not be initiated into the Church. In fact, for a child of Christian parents, salvation begins as soon as they are born and thus they should be initiated into the community that will guide them through the salvation process. Later on these children who were baptized do make their own decision concerning Christ as they learn for themselves who he is and what he has done. Baptism will be featured multiple times as we continue through the Acts of the Apostles and is certainly an important part of the Christian life. If someone claims to be a Christian they should have either already been baptized, or be waiting to be baptized. I do not believe anything else to be acceptable for someone claiming to be a Christian. The Church, what the baptized are initiated into, is in general terms the worldwide body of people who have been baptized and are indwelt by the Holy Spirit (called “believers” in Christian circles). The Church is such an essential part of salvation that Jesus himself personally trained and appointed those who would lead it during its initial phases. These were the Apostles, whose acts, words, and deeds we are currently reading about. And not only were Apostles appointed, but the Holy Spirit was, and still is, given to all who are members of the Church in order to guide the Church and protect it. The Church is not a man-made institution, but a divinely appointed institution whose main purpose is to guide people along the way of salvation and help them avoid the snares the devil has laid with the purpose of leading people off the path of salvation. In order to be restored to their perfect, original state of being from their evil and depraved state of being a person must be initiated into the worldwide community of believers by being baptized and receiving the Holy Spirit. Then they should learn from others in the community of believers so that they will be able to discern where God is leading them and avoid the snares the devil has laid for them. Next up will be chapter 3. * Protestantism disagrees as to whether or not one can lose their “salvation,” i.e. their admittance into heaven. This entry was posted in Theology and tagged baptism, Christianity, church, community, Holy Spirit, Jesus, Protestantism, religion, salvation, theology on July 24, 2013 by SRQTom. Peter has now finished his speech defending the Galileans who were accused of being drunk (see 2.14-36) and in this passage we see the response of the people to Peter’s speech. 37 Now when they heard this, they were pierced to the heart, and said to Peter and the rest of the apostles, “Brethren, what shall we do?” 38 Peter said to them, “Repent, and each of you be baptized in the name of Jesus Christ for the forgiveness of your sins; and you will receive the gift of the Holy Spirit. 39 For the promise is for you and your children and for all who are far off, as many as the Lord our God will call to Himself.” 40 And with many other words he solemnly testified and kept on exhorting them, saying, “Be saved from this perverse generation!” 41 So then, those who had received his word were baptized; and that day there were added about three thousand souls. 42 They were continually devoting themselves to the apostles’ teaching and to fellowship, to the breaking of bread and to prayer. Before moving forward in this passage it is helpful to remember the identity of “they” in v.37. “They” refers to Peter’s audience who just heard his speech, which is specifically identified for us in v.14 as “men of Judea and all you who live in Jerusalem.” So then the crowd Peter was addressing was most likely predominantly, if not entirely, Jewish. Knowing this identity helps us understand their actions in the following verses and why Peter said what he said in vv.14-36. The Jews had expectations (and still do) for the coming of the Messiah and the inauguration of a kingdom as prophesied in the Old Testament. Peter’s speech was aimed at convincing them that Jesus was the Messiah that they had been expecting. After hearing Peter’s argument they were “pierced to the heart” when they realized that they had crucified the Messiah they were expecting, so they ask the Apostles what it is they should do, and Peter tells them to repent and be baptized. In the context of this passage what the Jews are repenting of is their lack of belief in Jesus’ Messianic identity. Up until this point they had rejected Jesus’ identity and even crucified him. So Peter calls them not only to cease rejecting Jesus as Messiah, but to accept Jesus as Messiah and join the 120 or so others who at this point comprise the Church by being baptized. While Christendom disagrees over what happens during baptism, it does agree that it is an essential part of the Christian life. It was commanded by Jesus in Matthew 28.19, and is commanded here by Peter. V.41 indicates that baptism is one’s entrance into the Church, or the worldwide community of Christians, and that baptism should follow coming to some level of belief concerning Jesus. In this particular episode it seems to me the level of belief achieved was acceptance of Jesus being the prophesied Messiah. Today most churches expect you to understand not only Jesus’ identity, but the foundations and basics of the Christian faith. These are best summarized, I think, in the Nicene Creed. These verses describe the early community of believers and what was happening amongst them. I believe these verses to be fairly straight forward and not requiring much explanation. However I do want to emphasize a few things. First, they were devoting themselves to the Apostle’s teaching (v.42). They recognized that the Apostles had been chosen by Jesus and tasked with instructing others in what Jesus had taught them. We should imitate their humble attitude when we devote ourselves to the teachings of the Apostles (i.e. read the New Testament). Not only does Christianity claim to be historical, but it also claims to be revealed. The Apostles did not teach their own ideas, but rather taught what had been revealed to them by Jesus, and so to challenge the teachings of the Apostles is to challenge the teachings of God. Secondly, they were devoting themselves to prayer (v.42). Prayer is an essential part of the Christian life and must be practiced throughout the day. Our prayers should be focused on things that will be spiritually beneficial for us, not things like new boats and cars. Written prayers are a great way to learn to pray for things that are spiritually beneficial. 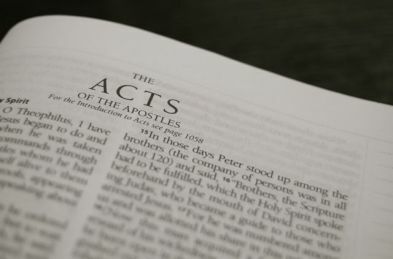 See the post on Acts 1.12-14 for more on this topic. Thirdly, they were devoting themselves to fellowship and eating together (vv.42, 44-47). These verses are fairly self explanatory as to what this fellowship entailed, so I won’t expand much upon it. I do want to emphasize though that the Christian life is lived in community and this includes helping others in need (vv.44-45) and worshiping together (vv.46-47). The Christian life cannot be lived in isolation, it must be lived within a community of believers. For the next post I’m going to explain more about salvation, baptism, and what it means to have joined the Church. It really does deserve its own post and I think it is important to understand. This entry was posted in Acts of the Apostles, Bible and tagged Acts, Acts of the Apostles, Bible, book of Acts, Christianity, God, Jesus, religion, theology on July 19, 2013 by SRQTom. In these verses we have the last half of Peter’s response to the people who accused the Galileans of being drunk. In the first part Peter said that what they were witnessing was the fulfillment of the signs that the prophet Joel said would occur when Messiah comes. In this part we see Peter arguing that Jesus is the prophesied Messiah. 22 “Men of Israel, listen to these words: Jesus the Nazarene, a man attested to you by God with miracles and wonders and signs which God performed through Him in your midst, just as you yourselves know— 23 this Man, delivered over by the predetermined plan and foreknowledge of God, you nailed to a cross by the hands of godless men and put Him to death. 24 But God raised Him up again, putting an end to the agony of death, since it was impossible for Him to be held in its power. Peter begins his argument by recounting the pubic nature of Jesus’ earthly ministry, which was known to everyone (see v. 22 “as you yourselves know”). Jesus’ ministry was not a private affair between him and 12 other men, but was instead a public affair. Jesus was out amongst the people teaching and performing signs and wonders. Even Jesus himself says this in John 18.20, “Jesus answered him, “I have spoken openly to the world; I always taught in synagogues and in the temple, where all the Jews come together; and I spoke nothing in secret.” Christianity doesn’t claim to be based on a private revelation given to one person or a select group of people, but rather claims that its founder taught and worked miracles in public. The only way Peter could say, “as you yourselves know” and for his words to be taken seriously so that we have them not only preserved, but also believed 2000 years from when they were spoken, is if what he is claiming is true. Otherwise, if his words were false, they would not have been taken seriously and his words not believed nor preserved; he would have been laughed at and dismissed by his audience. In vv. 23 Peter reminds his audience that Jesus was put to death publically by crucifixion and that they witnessed this event. Then in v. 24 Peter makes the claim that Jesus was raised from the dead, which he then moves on to support in vv. 25-32. 29 “Brethren, I may confidently say to you regarding the patriarch David that he both died and was buried, and his tomb is with us to this day. 30 And so, because he was a prophet and knew that God had sworn to him with an oath to seat one of his descendants on his throne, 31 he looked ahead and spoke of the resurrection of the Christ, that He was neither abandoned to Hades, nor did His flesh suffer decay. 32 This Jesus God raised up again, to which we are all witnesses. Peter quotes a passage from Psalm 16.8-11 and then proceeds to explain how these verses cannot refer to King David himself since David died, was buried, and his tomb is (or was during Peter’s time at least) still with them (v. 29). David thus did go to Hades (i.e. the place of the dead, everyone goes there regardless) and his body did suffer corruption. This is in contrast to what Peter claims about Jesus. According to Peter Jesus was raised from the dead (v. 24) and is thus not in Hades nor is his body decaying and suffering corruption. Peter is saying that David was predicting the resurrection of the Messiah in these verses, and that since Jesus was resurrected he fulfilled this prophecy and that all the Galileans, those who are accused of being drunk, have witnessed Jesus’ resurrection as well (vv. 30-32). Peter continues by saying that not only has Jesus risen from the dead, but is seated at the right hand of God (representing supreme power and authority). He supports this assertion by citing Psalm 110.1, a passage which was believed to be describing the Messiah (Matthew 22.41-46; Mark 12.35-37; Luke 20.41-44). Next week we encounter the response of the people to Peter’s speech. This entry was posted in Acts of the Apostles, Bible and tagged Acts, Acts of the Apostles, Bible, book of Acts, Christianity, God, Jesus, religion, theology on July 15, 2013 by SRQTom. 1.1-11 – Introduction: This book is a continuation of the author’s previous account, the Gospel of Luke. The author informs us that this account will deal with the coming of the Holy Spirit, which was promised by Jesus during his Earthly ministry. 1.12-26 – Replacement of Judas: When the Apostles were praying after having returned to Jerusalem following Jesus’ ascension it is revealed to Peter that someone should be selected to occupy Judas’ apostleship since it is now vacant following Judas’ suicide. Matthias is selected to occupy the vacant office. 2.1-13 – The Coming of the Holy Spirit: During the Jewish festival of Pentecost the Holy Spirit came and rested on each one of “them” (probably referring to the group of people that were gathered to pray together in 1.12-14) and they were speaking in foreign languages so that those who were also in Jerusalem struggled to explain to themselves how it was possible that they were hearing people from Galilee speaking in their own native languages, since the Galileans most likely did not know the languages in which they were speaking. The Spirit will be bestowed upon men and women, slaves and free. In short there will be no distinctions made when the Spirit is bestowed; it can be bestowed upon anyone. And everyone who receives the Spirit will see visions, dream revelatory dreams, and prophesy. There will be wonders in the sky above and on the earth below including: “blood, fire, and vapor of smoke;” a darkened sun; and a moon of blood. The immediate accompanying sign that Peter likely has in mind is prophesying, since in v. 11 it says, “…we hear them in our own tongues speaking of the mighty deeds of God.” The second accompanying sign Peter likely has in mind is the darkened sun and moon of blood. The Gospels record that during Jesus’ crucifixion the sky was darkened from about the sixth hour (noon) to the ninth hour (3 p.m.), and Luke adds the detail, “because the sun was obscured” (Matthew 27.45; Mark 15.33; Luke 23.44-45). What is likely being described here is a lunar eclipse since it can last for several hours and turns the moon a reddish color, giving it the appearance of blood. Peter interpreted Joel’s prophecy to be referring to the kingdom of Messiah prophesied in the Old Testament, which is why he changed the words “After this” to “In the last days.” To a Jew the “last days” refers to the coming of Messiah when he will restore Israel politically and reign forever. This is the first stage of Peter’s argument that the promised Messiah has come since the sun was darkened and the moon appeared red like blood, the Spirit was bestowed, and men and women are prophesying. The proper response of the Jewish people then is in the last line of Joel’s prophecy that Peter quotes, “Anyone who calls on the name of the LORD will be saved.” It is only by belonging to the kingdom of the Messiah that they will be saved, otherwise they will perish. Here saved seems to mean in the sense of delivered from punishment; e.g. spending eternity with God rather than separated from God. So to summarize Peter’s speech so far: these people are not drunk, but this is the fulfillment of the signs that the prophet Joel said would occur in the last days when Messiah comes, and you all should recognize this and join us and receive the Spirit as well. In my opinion Peter could have stopped here and would have made his point quite clearly. Peter however continues his speech, and we will continue also, but in the next post. * The other possibility I can think of is that there was some distinction made between Matthias being an Apostle and the remaining eleven Apostles that Jesus himself had chosen. My main problem with this explanation though is that 1.26 says that Matthias was added to the eleven Apostles, which seems to go against there being any such distinction made. This entry was posted in Acts of the Apostles, Bible and tagged Acts, Acts of the Apostles, Bible, book of Acts, Christianity, God, Holy Spirit, Jesus, religion, theology on July 10, 2013 by SRQTom. Now we finally come to the event that the opening verses of the book prepared us to expect: the coming of the Holy Spirit. This is a very significant event as it marks the beginning of the Church. Since there is so much to cover with this event I will be breaking this up into several posts. First, the author provides for us the date on which the Holy Spirit was given: the day of Pentecost. This is a Jewish feast and it is dated 50 days from Passover. So, since Jesus was crucified on (or near) Passover*, rose 3 days later, and presented himself alive to the apostles over a period of 40 days following his resurrection before he ascended (see 1.3), we can conclude that approximately 10 days have passed since Jesus’ ascension and the coming of the Holy Spirit. It’s easy to skip over details like this, that seem to have no other purpose than to provide a date, but I would advise you not to do so. Such details are incredibly important. Details like this, and the genealogies (especially the ones in Matthew and Luke), tie Christianity to historical events, dates, and people. Christianity is based on historical events, such as the resurrection of Jesus, his ascension, and the coming of the Holy Spirit (all of which have been recounted to us by this point in the book). Christianity is not a philosophical system that someone produced in a vacuum. Christianity doesn’t hinge on a particular doctrine, but rather on the historical event of Jesus’ death, burial, resurrection, and ascension. Christianity is only false if these events did not happen. As a side note, Mike Licona has some great resources (free and paid) to take advantage of if you are interested in investigating the historicity of Jesus’ resurrection. His site is: RisenJesus.com. It is this relation to actual historical events that sets Christianity apart from most, if not all, of the other major religions of the world. It is also this relation to historical events that I personally find to be the most persuasive aspect of Christianity. If there lived a man who claimed to be God, was killed, rose again, and ascended into heaven I have to explain those events somehow and come to a conclusion about them; I can’t merely dismiss them as fiction if they actually happened. We can see an example of people trying to explain to themselves a supernatural phenomenon in this passage. When the Holy Spirit came there was a noise, and tongues of fire came and rested on the Apostles. When the noise was heard the people who were in Jerusalem, people from every nation under heaven, gathered together and were perplexed because they heard men who were from Galilee speaking in their (the people in Jerusalem, i.e. not the Apostles) own language (for the languages see the list in vv. 8-11). We can see two different attitudes to the event: 1) some are perplexed and bewildered and seeking to understand how this could be possible; 2) others are dismissive of the event and mock the Apostles as simply being drunk. Neither group is doubting the event happened, but rather is trying to make sense of it. So to recap this passage: when the Holy Spirit came there was a noise, the people of Jerusalem gathered together when they heard the noise and found the Apostles speaking in their (the people of Jerusalem, i.e. not the Apostles) own native languages. This perplexed them because they identified the Apostles as being from Galilee who likely did not learn the languages in which they were speaking. Pay attention to these events and remember the signs that accompanied the coming of the Holy Spirit, it will be important later. That wraps up this post. Maybe finishing chapter 2 in the next post. And that’s a big maybe, there’s a lot to cover in the rest of the chapter. *I’m not going to reconstruct a timeline here, but you can see the sequence of events by starting with Matthew 26.17; Mark 14.12; Luke 22.1; and/or John 13.1 and reading the rest of the account(s). This entry was posted in Acts of the Apostles, Bible and tagged Acts, Acts of the Apostles, Bible, book of Acts, Christianity, God, Holy Spirit, Jesus, religion, theology on July 5, 2013 by SRQTom.